These are the most basic of parameters for a cafe, we will be adding a lot more later! 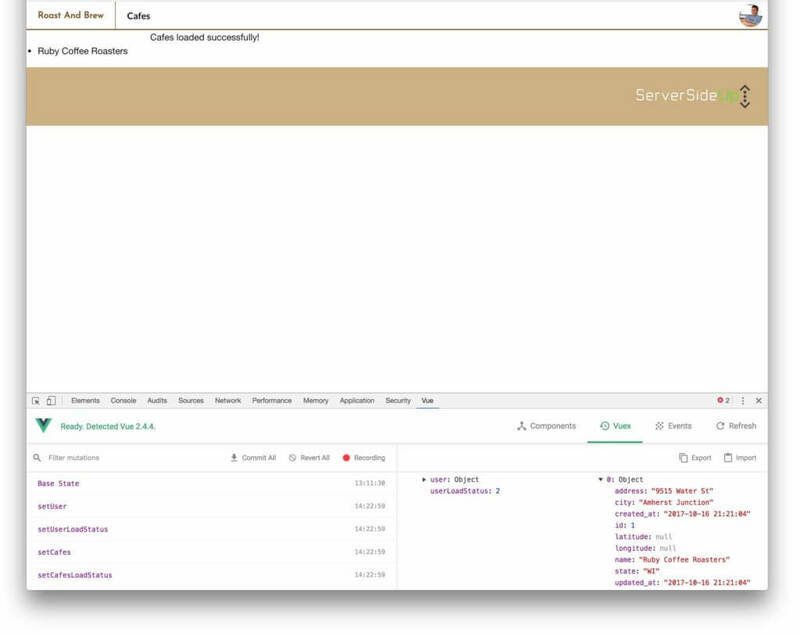 We also already have a Vue Router route set up for adding a cafe which is /cafes/new and a template for adding a cafe in the /resources/assets/js/pages/NewCafe.vue file. 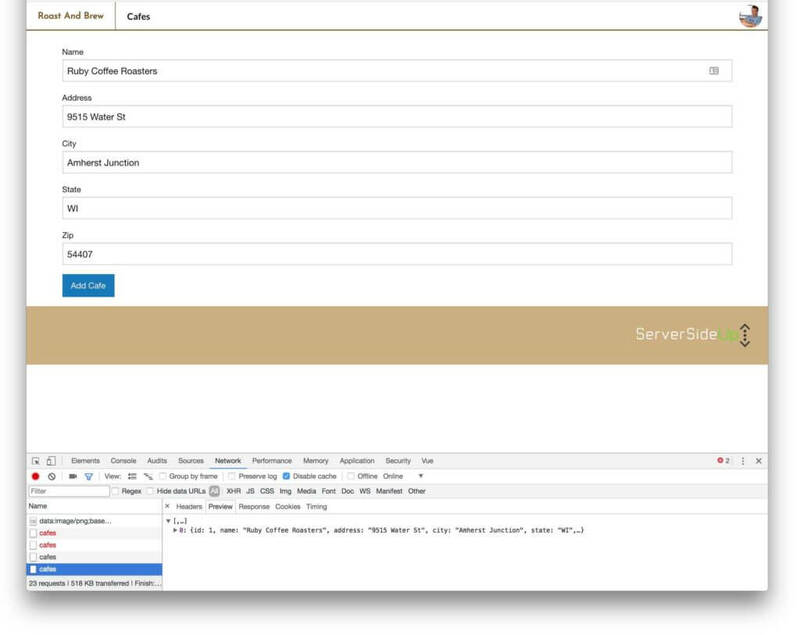 Add a form to the NewCafe.vue file that can be submitted with the new cafe. Send an action request to our Cafes module that we will be submitting a new cafe. Return either success or failure back to our front end, specifically the Vuex module. Reload the cafes and update our Vuex module. This is the basic flow for adding ANY content to our database with an API Driven perspective and a single page application with VueJS/Vuex. 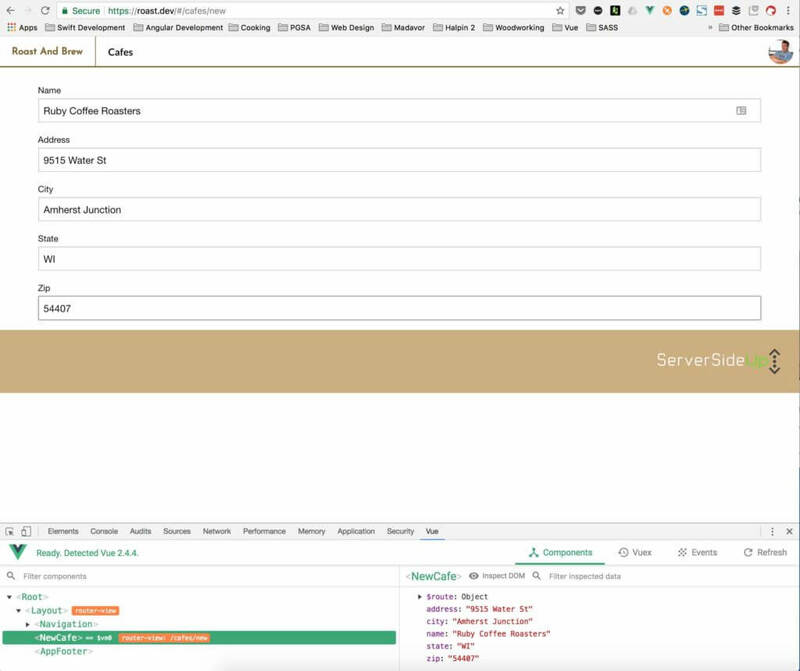 First we should open our /resources/assets/js/pages/NewCafe.vue file. We have nothing in this page right now, but in the template of the file, we will be adding our form. 2. I added a page container <div> with a class of page. I defined this in the the /resources/assets/sass/layouts/_page.scss file and just gave the page a margin top of 25px so we have some breathing room. Following the 7-1 pattern, layouts would be the best place to put this component. We can also re-use this across all of our pages. Now we need to add the v-model parameter to each of our inputs and bind the data to one of the variables in the object being returned by our component. What we are doing is binding the value of each of our inputs to a piece of data in our page model. Vue takes care of all of the updates when we type into an input. We can also access these variables inside of our component and do actions like pass them to actions to save to the database. We have a very basic form where each input is bound to a piece of data. Finally, we will have to add a simple submit button and create a method in our page component to handle a click. This is how we will kick off our form submission. Now whenever a user clicks on the Add Cafe button, we will call the method to submit a new cafe. We are now ready to submit an action to our Vuex module saying “hey, we want to add this new cafe!”. To do that, we will stay in our NewCafe.vue file and work with the submitNewCafe() method. Since we are calling an action on a Vuex module, we need to dispatch an addCafe method which we will implement on our module in the next step. The first parameter of the store dispatch method is the name of the action being dispatched. The second parameter is a JSON object containing the data we want to send in the action. In this case, it will be the value of our inputs. If you are new to VueJS, the this. references the local component’s data value. So what we are doing is dispatching an addCafemethod that will be received by our cafes Vuex module containing all of the data from our form. So now we have the action being dispatched, but nothing to catch the action so that’s what we are doing now. We will need to open our /resources/assets/js/modules/cafes.js file to edit the module. First, we need to add a variable to our state which will keep track of our cafe add status. We should simply add: cafeAddStatus: 0 at the end of our state which will initialize our variable. One thing to notice about this method’s signature is that we have an extra piece in the decoupled data in the first parameter, it’s dispatch. What this does is allow us to dispatch actions from within our Vuex module which we will be doing to re-load our Cafes after the cafe has been added. The second parameter, data, will be our form data object. 1. We haven’t added the setCafeAddedStatus mutation yet, we will do that next! 2. When successful, we will be setting the cafeAddedStatus to 2 which we can use to display the successful addition of the cafe. 3. When successful, we also dispatch the loadCafes action which will reload the cafes containing the one we just added. 4. On failure, we flag the cafeAddStatus to 3 which we can use to display an error. This will set the cafeAddStatus accordingly to what we have as a state in our app. We can now use this to show data updates in our app. Our Vuex module is ready to rock. In this tutorial: Add Laravel API End Points – Server Side Up we already built the endpoint to add a cafe. which is POST /api/v1/cafes.We just completed the front end side that calls the appropriate route. Upon completion, we will have a cafe in the database and this route will return the status. Make sure you run your npm build dev or production if you want! So I added Ruby Coffee Roasters in Nelsonville WI. Side note on Ruby Coffee, if you haven’t tried them yet, try them! Small town in central Wisconsin that does an amazing subscription service and sells locally and also in Long Beach, CA . Check em out here: Ruby Coffee Roasters | Colorful Coffees roasted in Central Wisconsin, USA. You can see on the response back I got all of the cafes this means that our cafe was added successfully and Vuex called the action to load the cafes again. This is exciting! We now have a way to add cafes to our application! And even better, everything automatically stays in sync with Vue and Laravel as it’s all reactive with Vuex with minimal API requests! The next tutorial we will add a few finishing touches to our API Request and then focus on some awesome enhancements for displaying the cafes.. I’m thinking maps could be helpful!